Hi, I'm Jess Skultety, and I'm a quilting blogger, teacher, lecturer, and current President of the Central Jersey Modern Quilt Guild! Thanks for coming by for Sew Mama Sew's giveaway day. I've pulled together a Cotton + and Steel bundle to give away to anyone in the whole wide world! All you need to do is answer this question in a comment: If you were to make an epic quilt for yourself, what kind of quilt would it be? P.S. You should totally make that quilt if you haven't already! I'm in the middle of my epic Anna Maria Horner quilt, and I'm loving every second (even though it sat in time out for a good year and a half). Here's a snapshot of me working on it at our recent CJMQG retreat (thanks Laura!). The giveaway will end on 12/13 at 7 PM EST. I will choose the winner via Random Number Generator and email them. No need to be a follower to enter, but I'd love for you to stick around if Quilty Habit strikes your fancy. :) Take a look around (here's my most recent educational post on Alternate Gridwork) and also read up on some of the past issues of The Wonky Press (the next one goes out next week!). Plus... I'll definitely have a finish to share this Friday! It's a good one! Here's a hint. Enjoy blog hopping and Happy Holidays! P.S.S. Don't miss the other giveaway running this week - a bundle of Snow Days fabric from Benartex! What a great question! My epic quilt would be a Baltimore Album with bird motifs. Thanks for the chance to win! I might currently be working on my epic quilt...it is all hand English paper pieced hexagons and I just have to add the borders. It is all Kaffe fabrics with black shot cotton accents. I also have a bucket list which includes a clam shell quilt...thanks for the inspiration and the giveaway! I think I may be working on my epic quilt, too! I'm doing a scrappy bed-size quilt in rainbow colors, my first quilt that big. I would like to make a Scrap Vortex quilt with bits and pieces from all the fabric I have ever owned! I have many quilts on my list that I want to make and probably the most challenging or epic would be an appliqued village with houses, shrubs, etc. I am slowing working on a epic quilt. Well it is a UFO at the moment but the Civil War Love letter one. Now the 24 mths of crap has finished I may now get back into it. I would love to make one of Judy's star quilts (like the Mariners Compass). I would love to make one of those wedding quilting with the rings on it, now I am feeling silly because I can't remember the actual name. My epic quilt is going to be a giant hexagon quilt that I'm going to Epp with as many different Cotton and steel fabrics as I can get! I'd like each hexagon to be different. Starting after Christmas!! Since I love improvisational style quilts, my epic would have to be an improv made with denim, wool, polyester, lace and linen! I might even hand quilt it in large stitches. Smiling. Gorgeous fabric, Jess! For years (eer since 2012...) I've been planning to make the Martha Stewart embroidered birds quilt but I can't decide whether to make all of the birds the same color or in a few different colors. I started making them true to color and then decided that it would be too nutty for me in a full size quilt. I have about 20 linen squares traced and ready to be embroidered if I would just make up my mind! I think I might be on the verge of my epic quilt. It is the start of one anyway. It was a round robin quilt using the score of the same name from Sherri Lynn Woods. It has 6 peoples hands involved in it. The issue I have is that I have joined it together and it is a cool big wall hanging size but I have so much more i could add to it BUT it is more of a graffiti type of mix (which I love ) but bigger quilt will be hard on the eyes I think. Anyway it is on my design board for now. I started working on my epic quilt several years ago. It was from a pattern in the Australian Quilt magazine. Between moving, a back injury and breaking my wrist, that quilt is still waiting to be finished. But I love the pattern and the fabrics. So one day I hope to complete it. Since I've never made anything larger than a baby quilt my epic quilt would be ANYTHING I can snuggle under. Feathers, lots of paper pieced feathers in black, white and some turquoise and coral for pop! Someday a Double Wedding Ring! And I follow you on bloglovin already - thanks! My epic quilt would be a modern spin on log cabin block in king size to fit my bed. Well, I currently have cut up and ready to piece a queen or king size (can't decide) Liberty plus quilt. But I would love to make a modern log cabin or court house steps, too. Decisions, decisions! My epic quilt would be entirely hand appliqué and hand quilted. A Piece O" Cake design or perhaps something by Sarah Felke or the Material Obsession crew. my epic quilt would be a queen-size double wedding ring. thanks for the giveaway. A LOVELY OLD FASHIONED DRESDEN PLATE QUILT . . . . . I have always wanted to make an appliqued portrait quilt of my late husband. I am new to quilting and in the middle of my first one. To me this is an epic project at present!! I'm not sure...maybe a cathedral windows quilt. There are so many in my head that it's hard to choose one, but I think that might be it. I would love to make one of those medallion quilts - a big queen sized quilt. An epic quilt for myself: Well that would just have to be on in a beautiful color range with very easy shapes as I haven't made any quilt so far! Would love to try though. My epic quilt would be a hand-quilted cathedral windows, queen-sized quilt. I haven't made it yet because I don't think I have developed the skillset to do this future quilt justice. One day! Thanks for the giveaway. I would like to make a New York beauty! Thanks for the opportunity. Great fabric choices and colors. I had fun peeking at your blog and clicked to receive your newsletter now too! Thanks for the chance. I am new to quilting, so every quilt is epic! However, I'd love to try my hand at the Preppy the Whale quilt. Not sure,perhaps a Kaleidoscope though there are fabulous quilt pattern. I have the pattern and the fabric for a Swoon quilt for our bed, but had to put it on the backburner for other stuff. I hope to finish it next year. Thanks! I'm planning an epic paper-pieced Lord of the Rings quilt.... eventually! Thanks for a great giveaway. For an epic quilt - hmmmm... Maybe a double wedding ring or a fully hand stitched clamshell quilt? Only been quilting for 4 years and I feel like an epic quilt for me would be a Dresden plate quilt. I love them. I am also in love with the Anna Marie Horner feathers. A hexi flower garden quilt inspired by a family heirloom. Oh those feathers!! Gorgeous quilt! I just finished up making my Tula Pink quilt just for me but I am also a Cotton and Steel nut and I am collecting a ton of prints to make something special for me. again! My epic quilt would be all improv! I love modern and improve quilting. I think my own personal epiq quilt would probably be a bookshelf quilt, similar to the one you made. I made a small bookshelf quilt for a friend back in September and that got me thinking just how much I could fill a bookshelf quilt with book and fabrics and other things that I love. Thanks for the giveaway! I enjoy following your blog. I haven't thought of doing an epic quilt, but I guess I need to start planning! I would like to try an entire quilt of improv. That's my area of least expertise. Thanks for the giveaway! It would be a wedding ring or cathedral window quilt. I'm getting ready to start a king size lone star quilt. It will be one I will be taking my time on. I'd love to make a new york beauty. Your epic quilt is great, I love the colour and all of the different blocks together. I've always loved a Storm at Sea quilt. The irregular shapes are so intimidating, but it's such a beautiful design. Thanks for the great giveaway! I have seen so many beautiful herringbone qayg quilts...I think I would try something like that! Wow. Epic quilt. I'm not sure I've ever thought about it. I'd love to make a king-sized quilt for my bed, but something simple and clean. I started a Stephen King quilt: a King size quilt (of course) with blocks where I embroider all the beginning lines of all his book and I couple those with the paper pieced reproduction of a cover for each book! if this is not epic I don't know what is! thanks for the chance!! What a great giveaway- such pretty fabrics. My epic quilt is actually a series- I'm trying to make one quilt for each part of the Episcopal Liturgy. We'll see if I can! I hope to make a DWR one day. Not sure when that will happen, but it is on my list! I really want to make a Dear Jane someday. A large Barn Raising quilt... all those little squares get to me! I would love to make a super modern dresden quilt. One day I shall! I'd love to make an epic queen-sized quilt out of English paper piecing! A queen sized epp quilt....pieced and quilted by hand. My epic quilt would be a Baltimore album but with a modern feel. Someday it will get done. Thanks! For myself, I would make a DNA quilted wall hanging. I am working on my applique skills and I think eventually I'll be good enough to make it. Thanks for the giveaway! My epic quilt would be a Dear Jane quilt. My epic quilt would be something mint and gray with lots of chevron and flannel to be cozy and warm!!!! I think a double wedding ring quilt is on my must do list! Gee, I've never considered what epic quilt I'd make. i tend to pick something and just go for it. Perhaps I'd choose one of Amy Garro's paper pieced ones. I find paper piecing difficult, but the results are worth it. Am really enjoying your blog, Jessica. I would love to make a Lollipop Quilt!! I'm currently collecting fabric for an epic Cotton + Steel quilt. I think after the january collections are released I'll have enough to begin planning! I can't wait! I've been fond of the indian orange peel I saw on the cover of QNM back in the late 90's. It would be epic! Maureen Cracknell has a skull quilt that I have a pattern for but I haven't attempted it yet! I would make the Farmer's Wife quilt. My attention span isn't long enough, however! Now that's a question I have never heard before! I would be a quilt that is soft, cuddly and warm! A real queen sized quilt for our bed! Totally finishing a bed sized quilt would be great! My epic quilt would be a cathedral window quilt. I have always loved the look of them, even before I started quilting. I would do it by hand. Unfortunately, my time is getting shorter and I will probably never get it done. I have been following you on Bloglovin for a short while. For myself? I've never thought of it! I'm always just thinking of my kids. Hmmm, something warm and bright and cozy for my bed that isn't too girly so that my husband likes it, too! Probably just a geometric design with bright solids. That is an excellent question and I do not have an answer! I have a number of quilts in my head I want to make but not one I would categorize as epic. I recently bought all the paper pieces for passagalicia -did I write this correctly. Now I am starting to collect fabric for it. Hmmm...I'm not sure. I'm still fairly new to quilting. Thank you! I'm quilting an epic quilt, the Tula Pink City sampler double-sided. My next epic quilt will be the Farmer's Wife samplers, also double-sided. Thanks for the chance! A Dear Jane with Kaffe Fassett fabrics. Mine would be a queen size dresden with lots of pink, yellow and gray fabrics. It has to be La Passacaglia quilt - all hand sewn!! I love 30's fabric and batiks so it would be something with one or the other. Not sure what to be honest. Oh gosh, there are so many epic quilts I want to make. One of my epic quilts is the Dest Jane quilt that I'm currently working on. 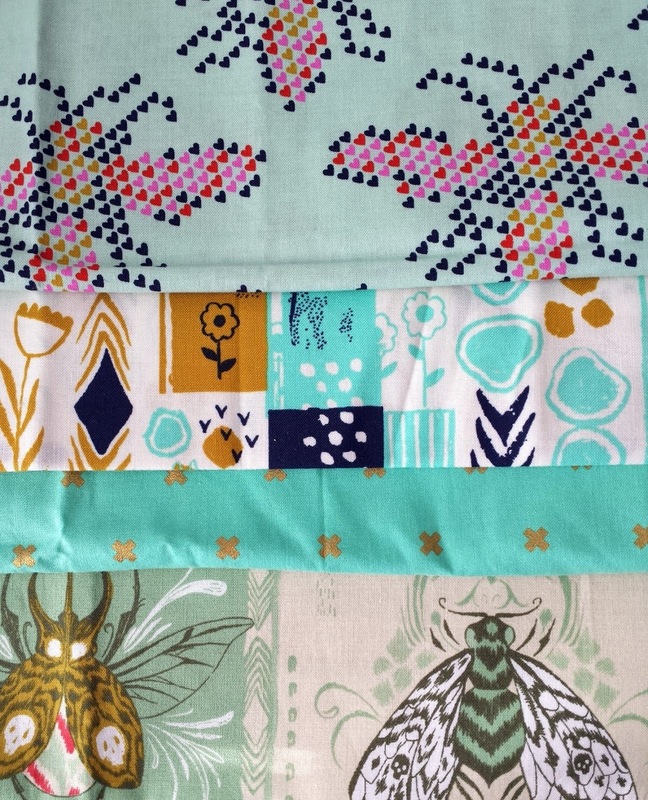 Such a lovely selection of fabrics! And I love your AMH quilt! The quilt that are currently on my wish list are both farmers wifes' quilts. Id love to make those! Wellll, a Dear Jane would sure be epic… and it is on my bucket list! i'm not sure, never tried quilting yet. I sew mostly garments and would use the fat quarters for handbags etc. I plan on making a friend a t-shirt quilt with all of his ballooning t-shirts from the festivals he has visited over the past 30 years!! It would be a hand stitched slow project like 1/2" hexes or green tea and sweet beans or La Passacaglia! Epic quilt? I would like to finish hand appliqued quilt I started. I have 2 blocks done and 10 to go! I like the feather paper piece quilts but I'm not sure I'm up to doing it. Paper piecing has not been my thing. Hmmm... maybe have the courage to start my first one, a simple one would be already epic! I am making that epic quilt right now! It's an EPP queen size quilt using 1" hexagons! I would like to make a memory quilt of fabrics and patterns that remind me of my life. My quilt dream is a wall quilt that is 30x30 has origami fabric butterflies, on a watercolor fabric background of more butterflies, with tiny beads to make it shine. When I get good enough at quilting to make it I will. In the mean time I will continue sewing and learning from talented people. My epic quilt would be a civil war quilt. An epic quilt for me would be a gargantuan wall quilt with portraits of my 10 cats (past and present). The denim quilt I'm working on has grown to epic proportions!! My epic quilt would be a giant Mariner's Star! Thanks! I would love to make One Block Wonder but haven't found the right material yet. Something rainbow! I think maybe a EPP hexagon rainbow quilt. That quilt is truly epic. I'd love to try her more simple feather pattern. Someday! My EPIC quilt is a California-king sized ohio star. Just need the guts to start a project that big! Dear Jane, just have to gear up for all those 4 inch blocks! Well, I've only be quilting for 2 years - I'm not sure what my epic quilt would me - I love sampler quilts so maybe one with applique on it. I would love to make a New York Beauty Quilt! I'd love to make a vintage-style crazy quilt as my epic quilt! I really want to make a dresden plate quilt! I'd love to make a king size quilt for my bed. I would like to make a quilt with all flying geese. I can't quite figure out how to leave a comment other than replying to one so I hope you can still see this... I have owned the single girl pattern for quite some time... I have opened it and read it and returned it to its sleeve several times... Originally I was going to make it with my AMH Garden Party stash but lost my nerve and am making a simple patchwork with those instead...I would make it if I could choose a fabric to work with but I am beginning to think I should start collecting cotton & steel prints as I seem drawn to them as I was with Garden Party.. I best get on it! I've already bought the pattern which has some very intricate piecing. After I finish my daughters wedding quilt, I plan to start it. To finish the EPP hexagon quilt that I started forever ago! I would love to make a queen size whole cloth quilt with intricate FMQ. Another one would be a whole cloth quilt of my city using a Haptic Lab template. Easy bubs! A New York Beauty! Love them. I'm not sure, but since I don't do a whole ton of quilting (i prefer bags/clothes), I think the max would be a lap quilt all in cotton+steel! The largest quilt I've made was a full size and that was big enough!! It would have to be a double wedding ring quilt... Either that or some sort of sampler. Thanks for the chance to win! My epic quilt (which I have not attempted yet) would be the traditional Double Wedding Quilt. I'm still very new to quilting (only finished one quilt top so far, and it's waiting to be backed and quilted!) so pretty much any quilt is an epic quilt for me! ;-) But I'd make one for my bed, in a bold geometric design. I am aiming to make La Passacaglia as my epic quilt, just need to jump in and start. A Mary Jane, or red and white 6" sampler quilt or one of Jen Kingwell's creations. I'll get to it when I have the time. Ha! Thanks. My epic quilt would be a queen size handkerchief quilt made with my great grandmothers vintage handrkerchiefs. I just finished hand-quilting my steampunk quilt - I started it 3 years ago, so it was definitely epic! A Farmer's Wife/Dear Jane or a medallion. I don't know, there are so many choices! My epic quilt would be a portrait quilt of my dad whom I lost recently. I'm working on my epic quilt right now. It is Love Entwined, a densely appliquéd quilt pattern from Esther Aliu. When finished, it will be 96 inches square. Right now I've finished the center and am working on the first round of borders. I would work on an AMH too! I am making the feathers quilt, but just using low volumes. One day I will make a quilt with all AMH. Thanks for the giveaway! love the question I would be a scrap quilt is my answer. Isn't it crazy how many of us don't make quilts for ourselves? I have been saving scraps and pieces from all the quilts I made for others. One day I want to use those all and make one mis-mash quilt for myself! I feel like I'll be wrapped in love by all those who I've made one for! MY eipic quilt is my hand pieced la passacaglia quilt, which is about 75% done, and due for a lot of attention over the Christmas break. Minimalist with lots of black fabric for negative space and purple accents. I've always wanted to make a postage stamp quilt using itty bitty squares. Something with paper piecing... Haven't tried that yet! I'm working on a modern sampler quilt I love! IF I ever make myself a quilt IT will be made out of my Pink Panther fabric that I've been hoarding for some time now. I just don't want to cut into my fabric!! Maybe one day!! Well, I'd try to finish the epic quilt I'm already making. A paper pieced 2" hexagon full sized quilt. I've been making it for the past ten years or more. My epic quilt would be a quilt made from quilted hexagons. I have a really, really insane epic quilt in progress. For my wedding I folded 1,000 origami cranes, so for my 10 year anniversary I am embroidering 1,000 origami cranes and making them into 1.5" hexagons. 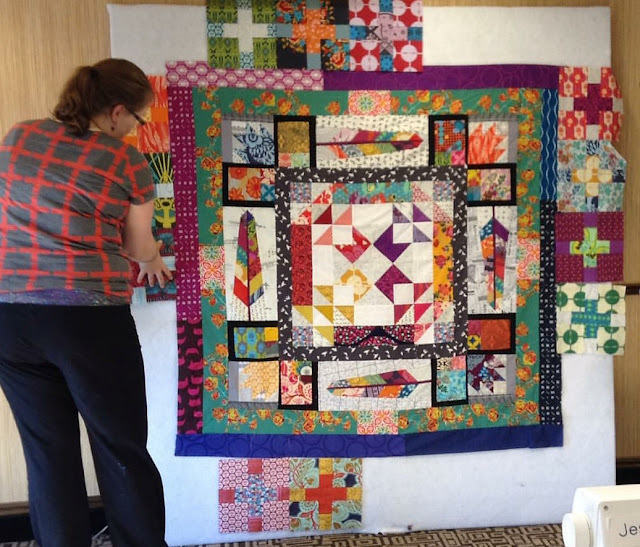 A quilt of small square scraps that make some amazing artistic color collage. Mine would be scrappy quilt using all those little pieces of fabric I've been collecting for years! One epic quilt for me would be to finish my 10,000 piece postage stamp quilt. Another is to design a unique Underground Railroad. It is being designed in my mind. I am working on my epic quilt. I have always loved the look of Yo-Yo quilts and I am now making my very own. Thanks for the great giveaway.